The speckled piculet (Picumnus innominatus) belongs to the family of piculets, wrynecks and woodpeckers, Picidae. The speckled piculet species are distributed in the Indian subcontinent, China and southeast Asia. These piculet species are among the smallest birds in the woodpecker family. These piculets are polytypic species. The speckled piculet (Picumnus innominatus) is a small bird, measuring 10 cm in length and weighing 9 to 13 grams. The male speckled piculet has rufous-orange to brown forehead with black spots and bars. The back, wings and the tail are olive green. There are creamy-white lores. There is a broad blackish green stripe behind the eyes. The underparts are creamy white with black speckles. The irises are blackish brown. The bill is black. The feet are pale gray. The speckled piculet call is a a high-pitched squeaky “ti-ti-ti-ti-ti” sound. 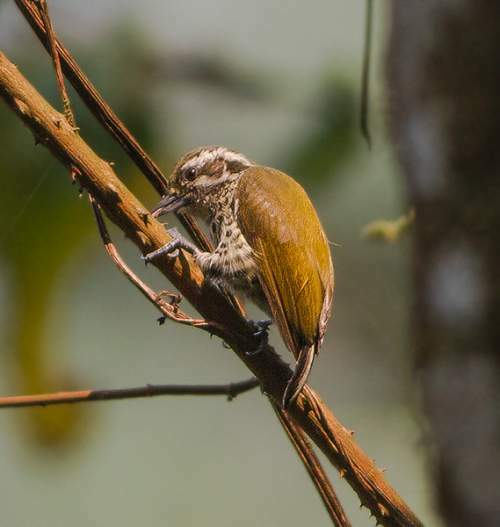 The speckled piculet species are distributed in India, Pakistan, Nepal, Bangladesh, Bhutan, China, Myanmar, Thailand, Cambodia, Laos, Vietnam, Malaysia and Indonesia. In India, these piculet species are distributed in the states of Jammu and Kashmir, Himachal Pradesh, Uttarakhand, Sikkim, West Bengal, Arunachal Pradesh, Assam, Meghalaya, Odisha, Telangana, Maharashtra, Andhra Pradesh, Karnataka, Goa, Tamil Nadu, Kerala, Nagaland, Manipur, Tripura and Mizoram. The speckled piculet nominate subspecies P. i. innominatus is distributed in Pakistan, northwest and north India, Nepal, Bhutan and Tibet (China). The subspecies P. i. malayorum is distributed in peninsular and northeast India, south China and southeast Asia. The subspecies P. i. chinensis is distributed in central, east and southeast China. 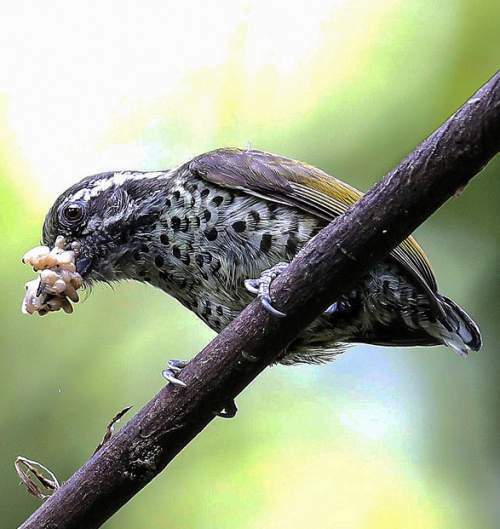 These speckled piculet species have high forest dependence. These species normally occur in altitudes from 0 to 3000 meters. The natural ecosystems of these piculet species include tropical and subtropical dry forests, wooded country, tropical and subtropical moist lowland forests and tropical and subtropical moist montane forests. The diet of the speckled piculet consists mainly of ants and termites. A variety of small insects, insect larvae and caterpillars are their primary food. The breeding season of the speckled piculet species is from January to May in much of its range. These birds are monogamous. Both the adults excavate the nesting hole with round entrance that just fits the bird, leading to an enlarged vertical chamber below. The clutch may contain 2-5 round white eggs. Both the parents take turn to incubate the eggs and care the hatchlings. The chick hatch out after 11-14 days. The nestlings fledge after 25 days. The speckled piculet species are non-migratory resident birds. Birds in higher elevations may move to lower levels and plains in winter. Post breeding, the juvenile piculets may disperse and establish in new locations within the range. They may make local movements for feeding and breeding within their range. The global population size of the speckled piculet (Picumnus innominatus) has not been quantified. The overall population trend of these species is reported to be stable. Throughout its range this piculet species is reported to be common to fairly common. The generation length is 4.2 years. Its distribution size is about 18,200,000 sq.km. Deforestation, habitat degradation and fragmentation and capture of adults and juveniles for pet trade are the main threats that may endanger the survival of these piculet species. 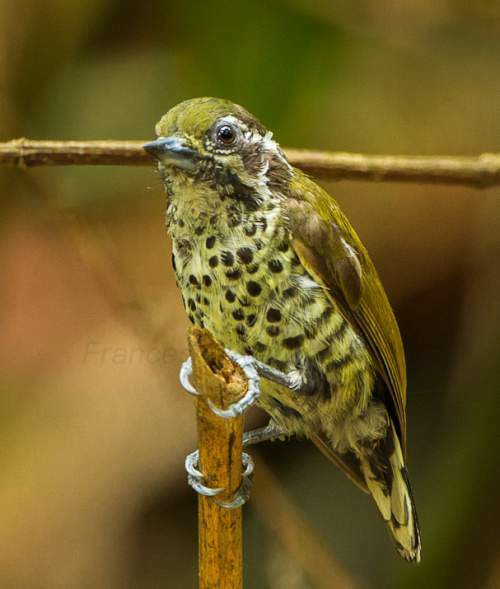 The speckled piculet (Picumnus innominatus) does not approach the thresholds for being Vulnerable, either under the range size criterion, or under the population trend criterion or under the population size criterion. The IUCN (International Union for Conservation of Nature) has categorized and evaluated the piculet species and has listed it as of "Least Concern". The CITES (Convention on International Trade in Endangered Species of Wild Fauna and Flora) status is ‘Not Evaluated’ for speckled piculet (Picumnus innominatus). The three recognized subspecies of the speckled piculet (Picumnus innominatus) are: Picumnus innominatus innominatus E. Burton, 1836, Picumnus innominatus chinensis (Hargitt, 1881) and Picumnus innominatus malayorum E. J. O. Hartert, 1912. The speckled piculet are sometimes separated in genus Vivia. Current topic in Birds of India: Speckled piculet - Picumnus innominatus.